There have been many rescue and repair disks over the years and some are based on Linux while other rescue disks are based on Windows. Our favorite has longs been Hiren’s BootCD which was and still is a complete repair toolkit on a disk, even though it’s getting a bit old now. But there are plenty of alternatives around, even paid rescue disks. 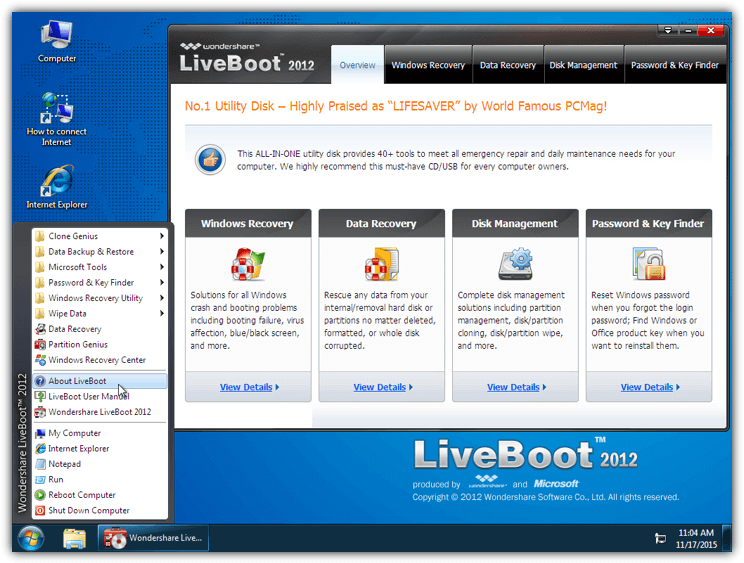 Wondershare, who are normally associated with video converting software, produce a Windows based rescue disk called LiveBoot 2012. Wondershare LiveBoot 2012 is a bootable repair and rescue disk that has over 40 tools included to fix computer boot problems, recover deleted data, clone hard drives, recover Windows and Office product keys and even reset Windows passwords. The downside is LiveBoot 2012 is shareware and costs $59.95. At that price most people would usually ignore it and go with one of the many free alternatives instead. LiveBoot has been offered as a giveaway a few times over the years but sadly not recently. There are however, a few interesting things to know about LiveBoot. Firstly, you do not need a license key at all to download the full version ISO which can be burned to CD or USB. And secondly, the setup installer version is what requires registration but all it does is offer tools for writing the ISO to media and some help guides, so that really isn’t essential either. Here we’ll show you how to legally and freely download and use Wondershare LiveBoot 2012, and also look at what the LiveBoot operating system includes. If you want to install the LiveBoot software, the good news is the license details from previous giveaways are the same for everybody and not unique to each user. Even though all giveaways have long since expired, the generic license codes still work. 1. Download the LiveBoot 2012 setup installer. This is the direct link to the setup file as you normally need to use a separate downloader tool to get it. 2. Run liveboot_full823.exe to install Wondershare LiveBoot. During the installation register the software by entering the following email and license code. Then complete the installation. 3. 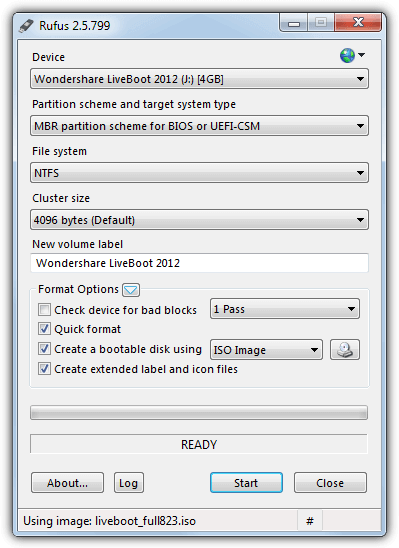 Using the Wondershare LiveBoot 2012 Wizard you can create a bootable CD or USB flash drive from the included ISO image. The CD burning tool is actually ImgBurn which you might have on your system already. The Wizard has a few how-to help screens to help you create the media and boot the system with the created media if you are not sure or having issues booting your system to CD/USB. The LiveBoot ISO is normally downloaded separately through the fronted tool or found inside the setup file. However, neither is required to get the full ISO image. 1. 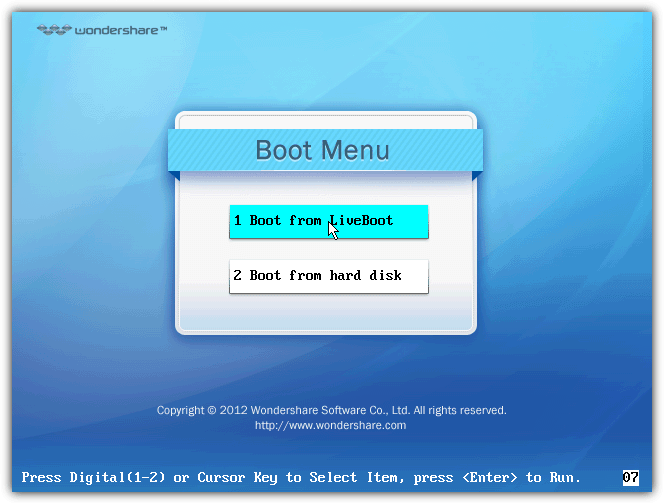 Download the Wondershare LiveBoot 2012 ISO image from the official direct link. This is the same ISO as the one in the registered setup installer and both have the same SHA-1 checksum. 2. Use the built in Windows tool or a third party ISO burning tool to write liveboot_full823.iso to CD. Alternatively use a tool like Rufus to write the image to a USB flash drive. Once you’ve created the bootable CD or USB, boot your computer with it. “Boot from LiveBoot” on the Boot Menu should already be pre selected and will automatically launch in a few seconds. Wondershare LiveBoot 2012 is a WinPE version of Windows 7 Ultimate 32-bit with network/internet connectivity and Internet Explorer 8. It also includes a number of Windows tools which you normally find in Accessories in the Start Menu; Calculator, Command Prompt, Computer Management, Disk Cleanup, Regedit, Remote Desktop, System Restore and a few more. The real heart of the system is the LiveBoot 2012 frontend application which gives access to a number of repair, recovery, management and maintenance tools and guides which can help with a range of issues you might be having. An alternative way to launch any of the separate LiveBoot tools is via the Start Menu. Here’s a rundown on what’s available. Many of these tools are to help with Windows loading issues or being unable to boot altogether and are for more advanced users, incorrect usage could make things worse. Boot File Recovery – Fix computer black screen on boot by replacing missing system boot files like NTLDR, NTDetect.com, BOOTMGR and NTFS.Sys. Boot Sector Recovery – Recover a corrupt or missing boot sector. 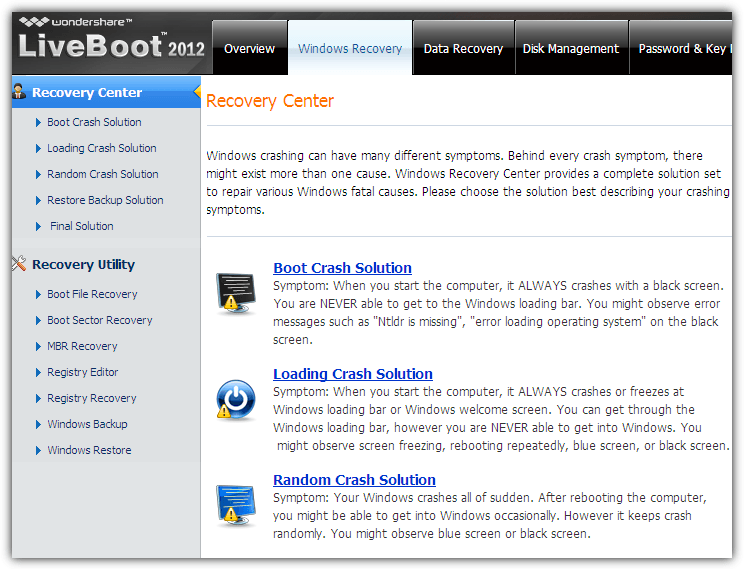 MBR Recovery – Replace a missing or corrupt Master Boot Record. Registry Editor – Directly edit the registry of your system from LiveBoot. Registry Recovery – Recover system backed up registry files (seems to be for Windows XP only). Windows Backup – Create a backup of your Windows system, MBR, Partition table, Registry or any combination of those four options. Windows Restore – Restore any of the backups created from the backup option above. There’s also a number of guides in the Recovery Center section that can help you find the cause and possible solutions to any problems you have, which might be repaired with the above or some of the other included repair tools. Using a bootable rescue disk like Wondershare Data Recovery from LiveBoot to try and recover lost or deleted files or partitions is a good move because if you are trying to recover files from within Windows there’s a greater chance the data might be accidentally overwritten. 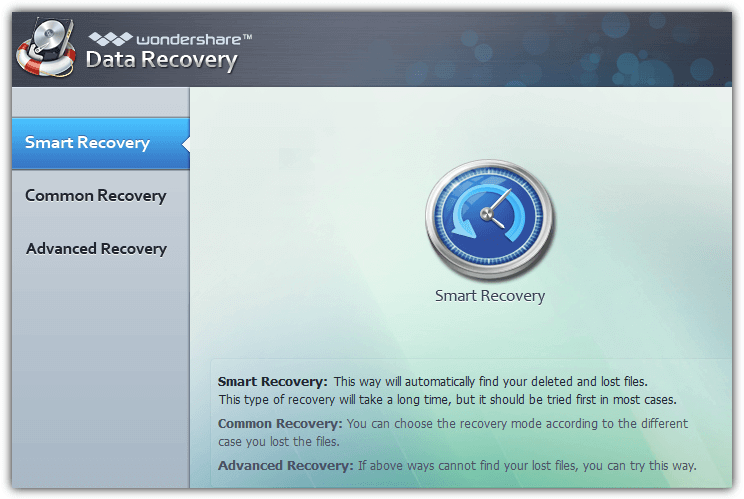 Smart Recovery – The default and will try to automatically find everything it can. Deleted File Recovery – Recover accidentally deleted files. Lost File Recovery – Recover files from corrupted or formatted partitions. Lost Partition Recovery – Try to recover the partition first if it can’t be identified. RAW Recovery – The deepest scan available and the last resort option as file names are not kept. Resume Recovery – Scans taking a long time can be stopped and resumed again later. The Disk Management section won’t fix or repair any specific Windows problems and is mainly for backing up, restoring, cloning, wiping or partitioning drives. Making a backup of your system first is always recommended in case attempted repairs cause extra unforeseen problems. Clone Genius – Will copy the partition or entire drive to another partition or drive, useful for migrating from an old drive to a newer or larger drive. 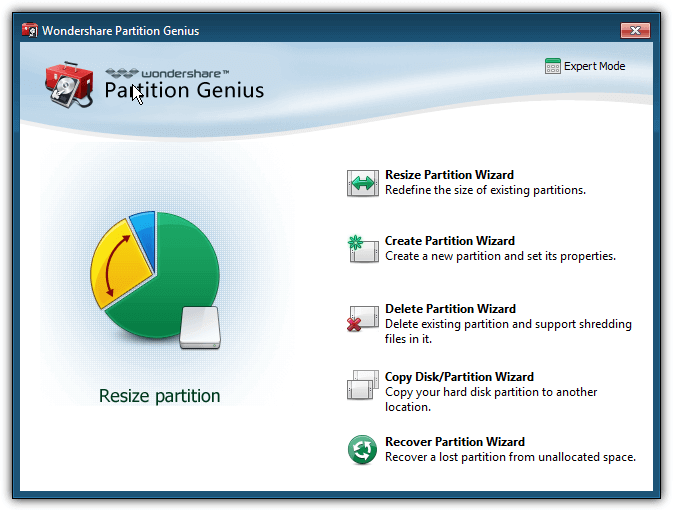 Partition Genius – Similar to other partition managers like Minitool Partition Wizard or EaseUs Partition Master, Partition Genius allows you to create, delete, resize and format partitions on your drives. Wipe Data – Two tools to wipe the contents of partitions or hard drives, essential if you are selling the drive or giving it to someone else. Data Backup and Restore – Allows the creating of an image backup or restoration of drives or selected partitions. 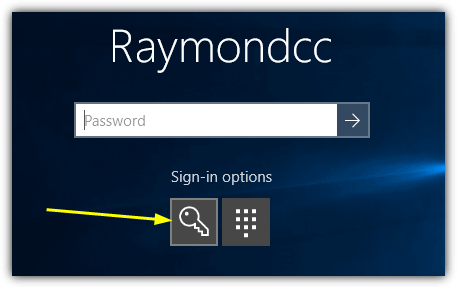 The Password and Key Finder tab allows you to reset the password for a user account in Windows, which is a huge help if someone has forgotten the account password to login. Simply select the target Windows install and the user, then click Reset. On next reboot the password will be gone. 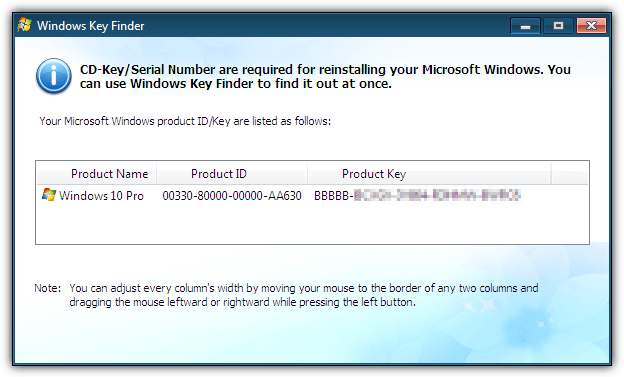 The Windows Key Finder is useful if you want to know your Windows 7 and below product key, while the Office Key Finder will show your installed Office 2000-2010 product key. These could be handy if Windows is beyond repair and you want to recover the keys before reinstall. The LiveBoot ISO image was created in 2011 and before versions of Windows like 8, 8.1 and 10 were released. 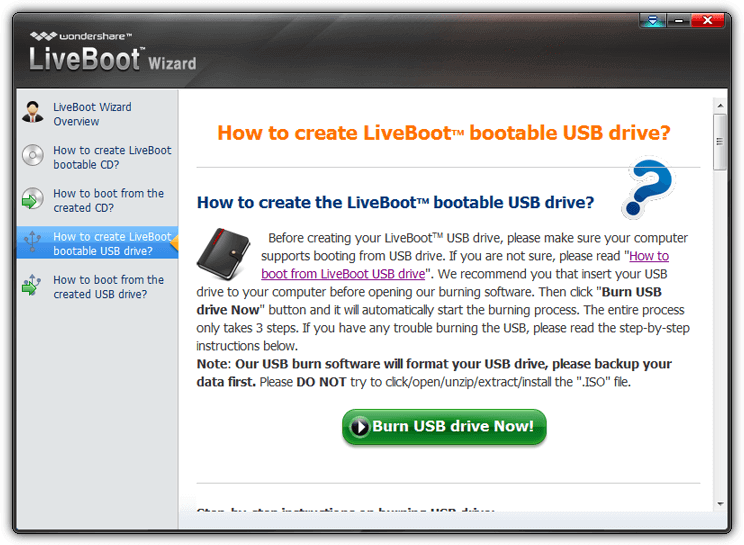 The website states LiveBoot is not 100% compatible with those operating systems, and says “It only can boot up your computer, Clone Hard Drive, Backup & Restore File and System, Partition, Format Hard Drive at bootable mode”. As far as we can tell most functions do actually work for Windows 8/8.1 and 10 without much issue although the Windows product key display option will not display the full key and show BBBBB for the first five characters. The areas which are most likely to cause problems, if any, are the tools in the Windows Recovery section that replace Windows boot files. To be safe, make sure you have adequate backups before trying any repairs if you are running Windows 8, 8.1 or 10. 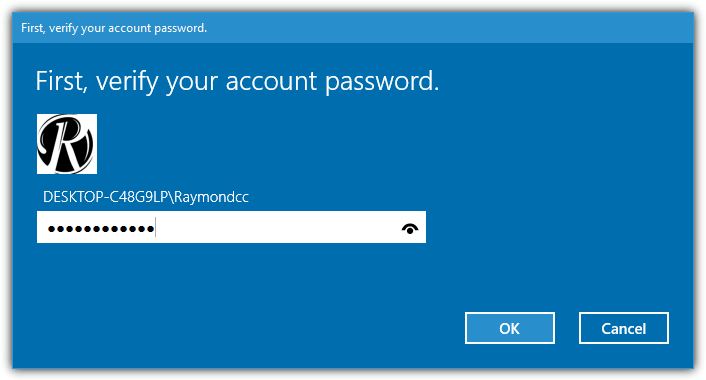 If you are using a local user account in Windows 10 or Windows 8/8.1, LiveBoot is still able to reset the password so you can get back into Windows. It will also work if the account is setup with a PIN number or picture in addition to a local password. However, it will NOT work with a Microsoft account because that password is stored on Microsoft’s servers and cannot be reset locally. Resetting a local user account password is easy, choose the password reset option in LiveBoot, choose Windows 10 and the account, then press Reset. At the next reboot, Windows will not ask for a password and log straight in. 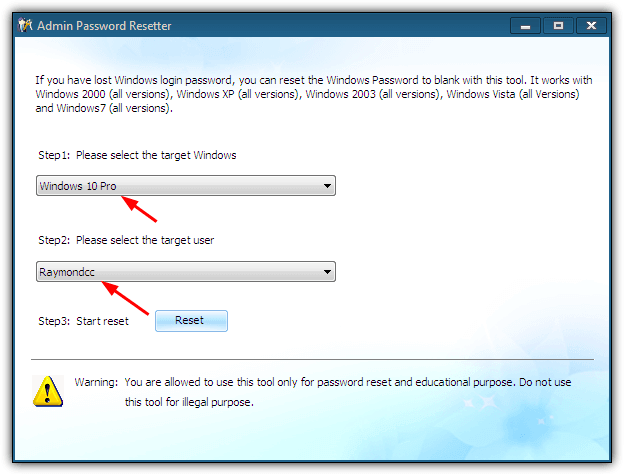 The procedure to remove both a user account password and PIN is a few more steps. 1. Reset the password using LiveBoot 2012 and then boot into Windows 10. If you are asked for a PIN click Sign in options and choose to enter a password. 2. Go to Settings > Accounts > Sign-in options, click Add under Password and create a new account password. 3. In the PIN section click the Remove button which is new in the Windows 10 November update. 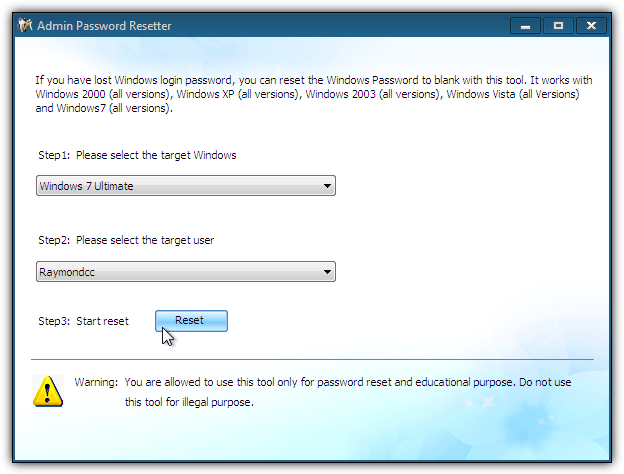 Click the Remove button again and then supply the password created in step 2. The PIN will now be removed. 4. As an optional step remove the account password again, click Change, enter the current password and press Next. At the new password window press Next and Finish to use no password. Both password and PIN will now be removed, remember it will only work on a local account. This method also works on windows 8.1 and the only real difference is the remove PIN option doesn’t require you to enter the account password. Tip: You can also bypass picture passwords in the same way although it’s even easier to remove. After resetting the password and logging in, simply click the Remove picture password button, creating a new password first is not necessary. Although it’s getting a little old now, on the whole Wondershare LiveBoot 2012 is an excellent repair and rescue disk and a great compliment to other rescue disks like Hiren’s BootCD. Given the fact this software still retails on Wondershare’s website for $59.95, it’s a complete no brainer to download it for free while you can. Even if you don’t need to use LiveBoot 2012 right now, there may come a time when you will be glad you have it. On choosing the target windows to reset to , the operating systems list won’t come.I use windows 10.Please someone help me out here. How to add USB 3.0 drivers into the image? My HP desktop has USB 3.0 ports only. When I boot with Wondershare Live Boot, I am unable to use my USB keyboard and mouse. Just wanted to say that live boot did more damage than good. I wouldn’t advise anyone to use it. I used for a boot repair and now the computer won’t re-start. Greetings Friends, as I would have liked to give some donation in support of this post, because the truth is worth it, :( I don’t have the resources to do so, at least I will know in facebook to contribute in some way, because everything here is very well done, recommended 100% and thanks a lot for deliver solutions. Thanks for the report, link fixed. Nice tool, it’s useful for me, thank you for sharing. This boot CD is great and very useful. However there is one big problem: I could not get it to work on my new Dell Inspiron Notebook. After some fiddling I found that it can not handle SATA drives. I had to dive into the BIOS to change it to ATA emulation – then it works. This is not a major problem, but for a commercial product with this relatively high price it is not acceptable. But for free – I can live with it. Thank you. Thanks, a very useful piece of software, but it would be great to have the regfix, cleanpc, speedfix, etc as well if a liveboot is not needed. Thanks so much Raymond! This is just what I was looking for to save a netbook for a friend. Brilliant!! thanks ray, ya a top man! I for one needed this ,thank you Raymond. Thank you Ray, this is great! Thanks, Ray, useful as always.. Thank you for sharing! Really Gr8!